Since the death of MySpace, most bands have found their way onto Twitter and Facebook, but they probably haven’t given much thought to LinkedIn as a means of promoting their work. The truth of the matter is that LinkedIn isn’t for everybody. It is intended as a professional networking environment in which people don’t expect to be bombarded by constant noise (status updates, event invites, group invites, etc. etc.). But seeing as how LinkedIn is the third most popular social networking site on the internet right now (February 2016), and it’s held that position for a long time, don’t you think there’s some value you could derive from LinkedIn marketing? If you aren’t familiar with LinkedIn, then this is a great place to start. Like any other social networking tool, LinkedIn allows you to create connections, both personal and professional. It isn’t like Facebook where people can “like” your band. It isn’t like ReverbNation where people can “become a fan”. LinkedIn isn’t a fan-building tool, per se. However, LinkedIn is a platform for business (and this is The Music Entrepreneur website, in case you’re lost). And, if you’re a musician, songwriter, composer, studio engineer, or a creative professional, you would say that you’re in business, wouldn’t you? 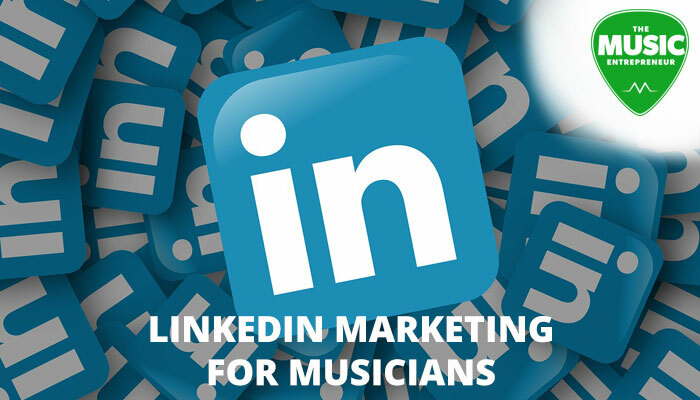 Jamie Leger also emphasizes this point in this very informative guide: Musicians Guide to LinkedIn – Getting LinkedIn Like a Pro! It’s important to note that you won’t get much benefit out of LinkedIn or any other social networking site without an upfront burst of energy, and ongoing spurts of effort. Setting up your profile often takes the most time and energy to do, and once you’ve populated your profile, you still need to maintain an ongoing and regular presence. If you can’t see yourself keeping up with your LinkedIn presence in addition to your other online channels, it may be best to leave it alone. Just know that it can be a valuable tool if you use it right. Much like YouTube, LinkedIn is a search engine in its own right. However, while YouTube searches a database of videos, LinkedIn searches a database of business professionals. What this means is that keywords and key phrases are just as important as any other search engine. What are some things people would be searching for if they were looking for someone with your skills and qualifications? Make sure to include these in your profile. Network with people. This seems pretty obvious. Social networking is called social networking because you’re supposed to be social. Is it possible that a corporate entity would be looking for a band for their upcoming motivational event? Is it possible that a movie production studio would need music for their next masterpiece? Is it conceivable that someone might require some mixing and mastering services for their multimedia presentations? Of course it is. Reach out and connect. Bonus tip: it’s also a good idea to connect with others in the music industry and collaborate with them. Ask questions in groups. Leger suggests that one of the best ways to take advantage of LinkedIn is to get involved in groups and ask and answer questions. This could be a great way to add value to others. You will also be seen as an expert in your field if you’re able to provide answers that others find helpful and useful. Promote your work. Developing relationships with people through the use of groups allows you to expose your work to more people. It’s worth noting that this is not a place to spam links, but if you can add value to people, they are more likely to act on the content you post. Search for opportunities. Leger notes that there are new music opportunities, contests and giveaways being posted to LinkedIn all the time! Publish articles on LinkedIn Pulse. This is a tip of my own. You can use LinkedIn Pulse as your blog, getting more exposure and attention for your posts than you might be able to on your own site. Is LinkedIn for everybody? Maybe not. However, there are musicians who are finding creative ways to use it to their advantage, so why can’t you? Do you use LinkedIn to market your music online? Why or why not? Let us know in the comments below.